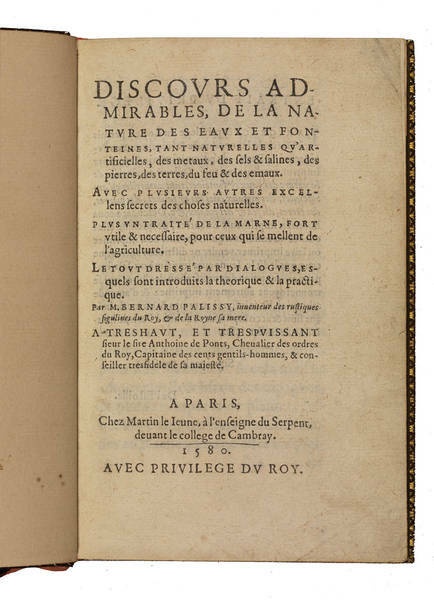 ARIOSTO, Ludovico. 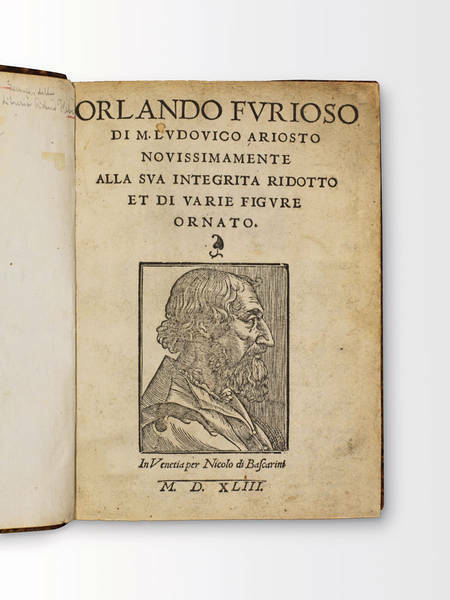 Orlando Furioso di M. Lodovico Ariosto, con cinque nuovi canti del medesimo. Ornato di figure & Con queste aggiuntioni etc. Quarto (255 x 182 mm. 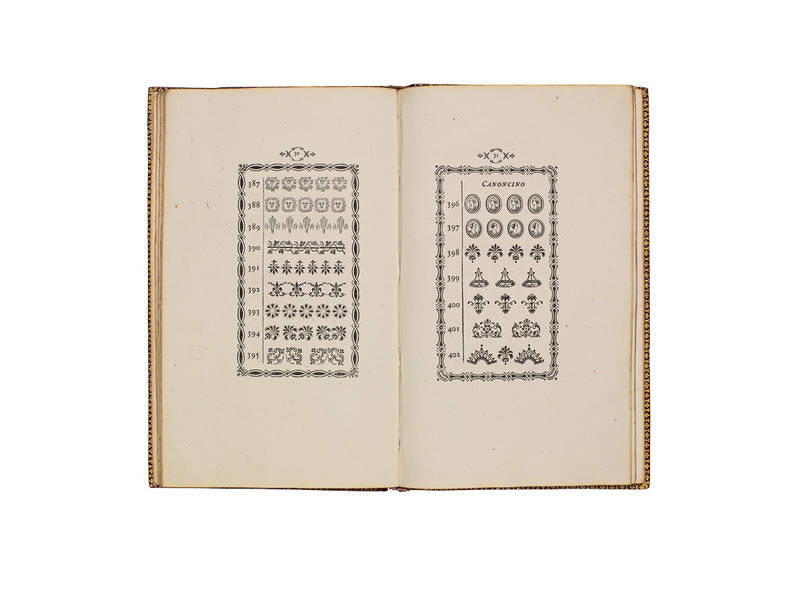 ), , 622,  pages, allegorical title page, woodcut portrait of Ariosto and 51 woodcut illustrations, at the beginning of each canto, each within full-page woodcut architectonic border. 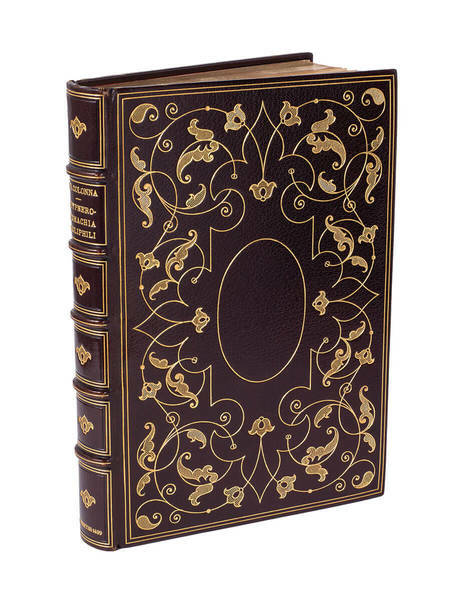 A very fine copy bound by Hardy in maroon morocco, spine in compartments with gilt title, gilt edges. 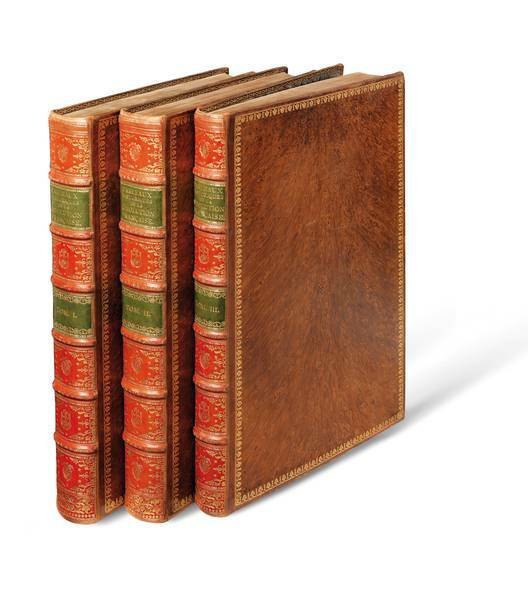 Rare and valued illustrated edition of Ariosto’s masterpiece, including the socalled Cinque Canti (published for the first time in the posthumous Aldine edition of 1545) and an extremely rich para-text. 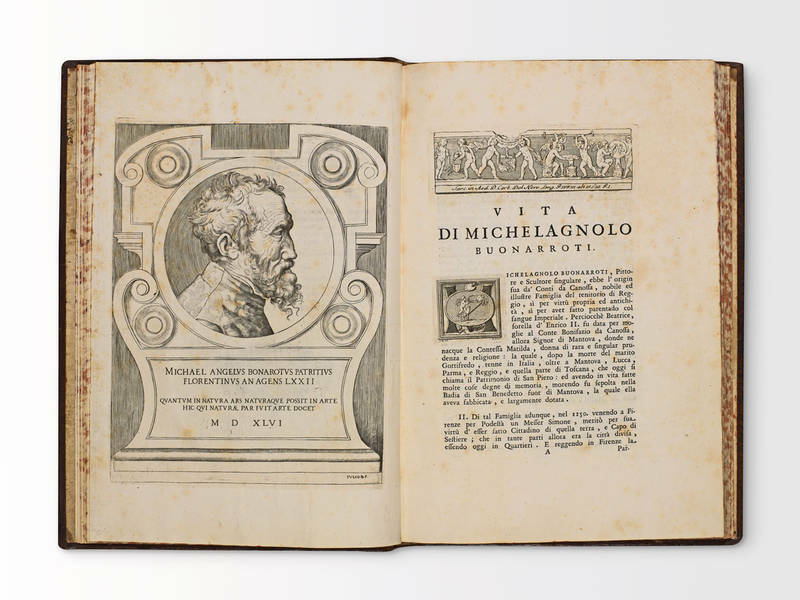 Despite being dated 1567 in the title-page, this is the same edition dated 1566 in other copies, as is demonstrated by the date on the title-page of the Cinque Canti (‘1556’). 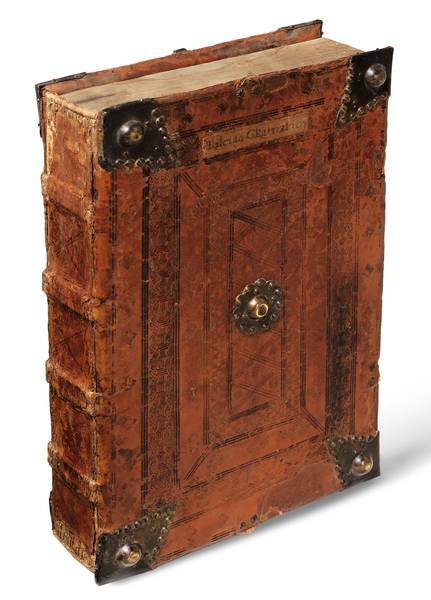 Giovanni Andrea Valvassori (1518-1572), also known as Guadagnino, was a Venetian woodcutter, cartographer, printer and publisher, active in Venice with his own press from 1531 to 1572. 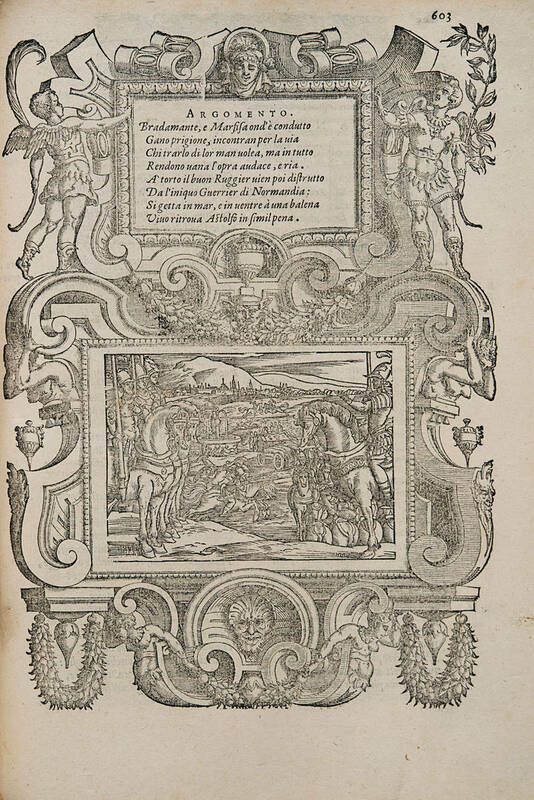 Valvassori was one of the most important 16th century editors of the Furioso, being responsible for the third illustrated edition of the poem, that of 1553, which followed the editions by Niccolò Zoppino (1536) and Gabriele Giolito de’ Ferrari (1542), and preceded the one by Vincenzo Valgrisi (1556). 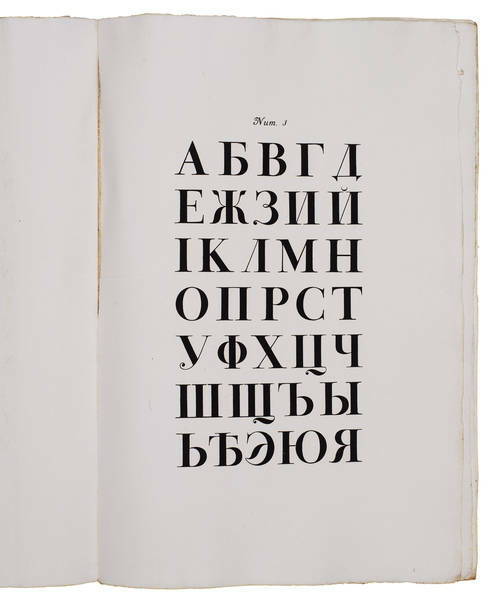 There is no doubt that the success enjoyed by the Orlando Furioso from the second decade of the century was also due to the fact that illustrations began to be produced for the poem almost immediately: publishers competed with each other in producing new editions (almost 200 in less than a century), offering different features to attract more customers. 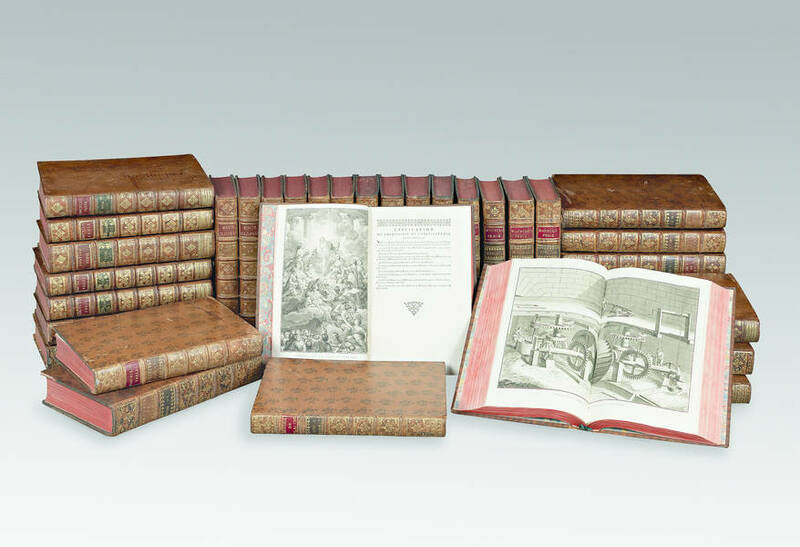 Both the Valvassori editions of 1553 and 1566 maintain the multi-narrative iconographic structure inaugurated for Ariosto by Giolito de’ Ferrari in 1542, but whose origins probably lie in the Strasburgan 1502 Vergil by Grüninger. 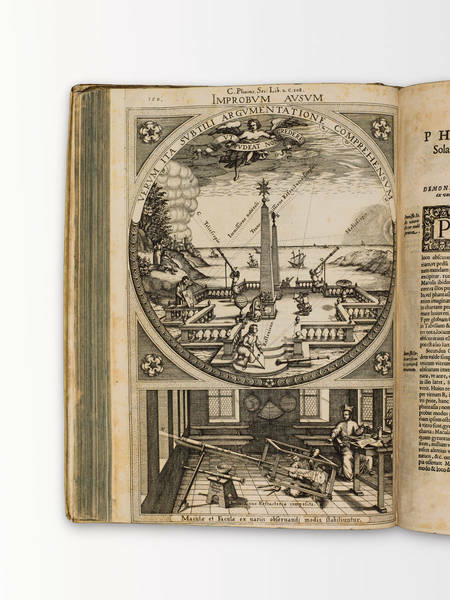 Each woodcut illustrates several successive moments of an episode within a single frame, giving the print the capacity to record a complex visual narration. 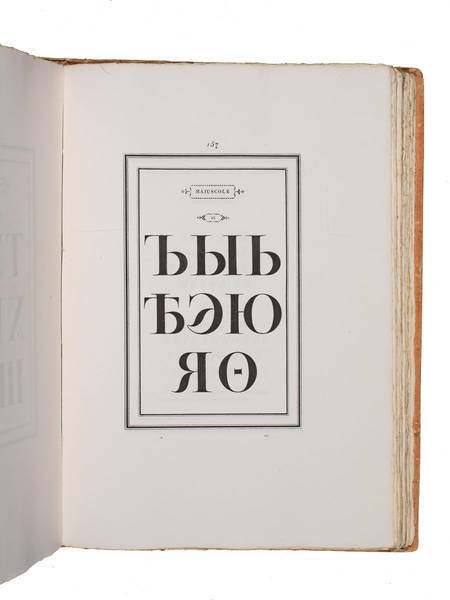 In Valvassori’s editions, “the figures carved in the foreground are characterized by excessively muscular bodies; on the contrary, as far as one moves towards the horizon, they get smaller until they become illegible. The different scenes are usually arranged in a chronological order, from the foreground to the bottom, with a zig zag motion” (Zanetti 1992, 131). 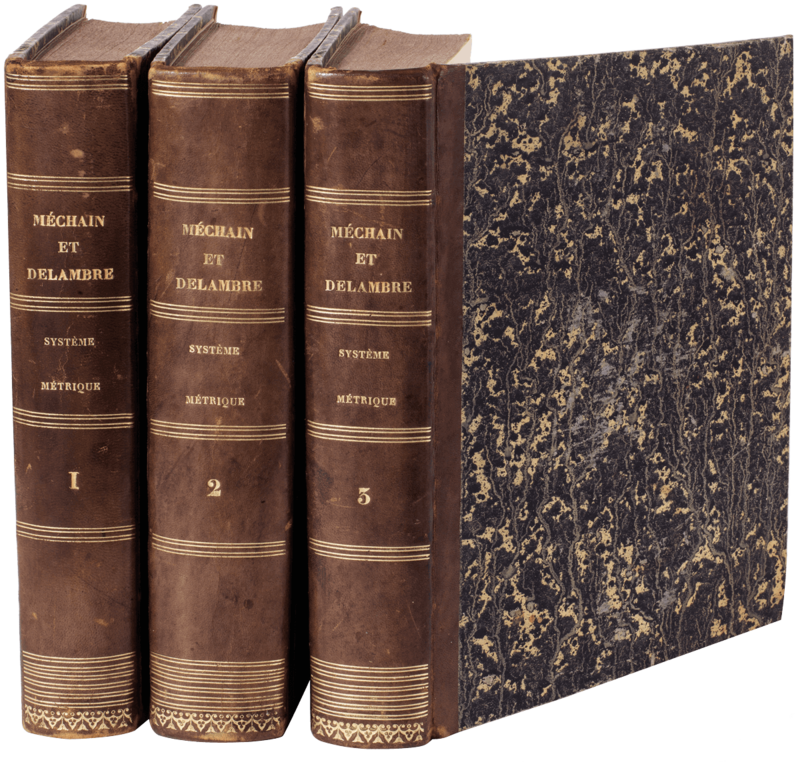 The 1566 edition distinguishes itself also in another respect, that is, the accentuation of the allegorical-moralizing interpretation of the poem. 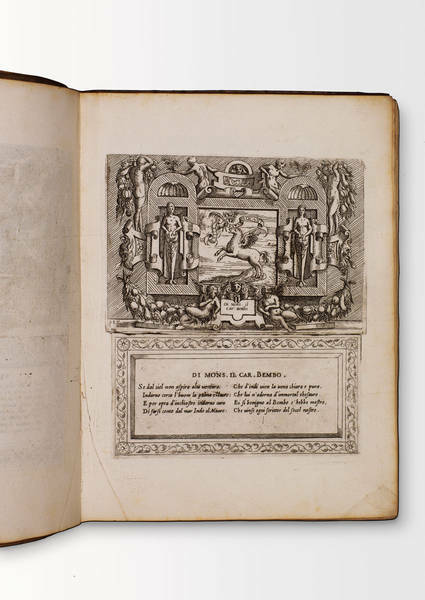 This was pursued through the Allegories introducing each canto, written by the Venetian jurist Clemente Valvassori (who signed also the Preface to the edition). In Clemente Valvassori’s commentary not only is Furioso’s relationship to its Classic models given less attention, but Ariosto, as a Christian poet, is even deemed superior to Homer and Vergil. Accordingly, Valvassori interprets the poem’s renown mutability as an allegory of the fragility of human life: “the world represented in the poem, according to his allegories, is a vale of delusion and tears where desire, carnality and blindness only lead to frustration and despair, unless God’s redeeming grace intervenes” (Javitch 1999, 38). 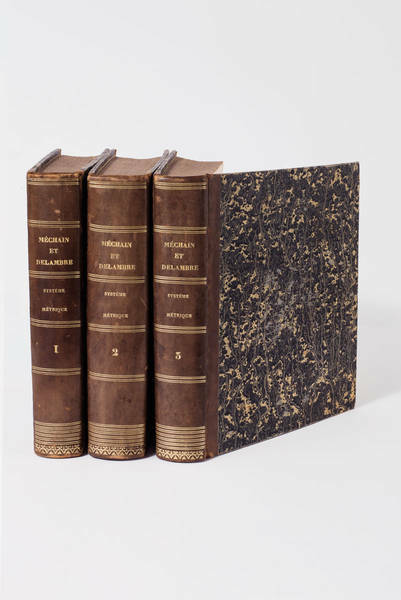 G. Melzi, Bibliografia dei romanzi e poemi cavallereschi italiani, 1838, 160- 161; Prince d’Essling, Les livres à figures vénitiens, 1914, III 112-116; E.T. 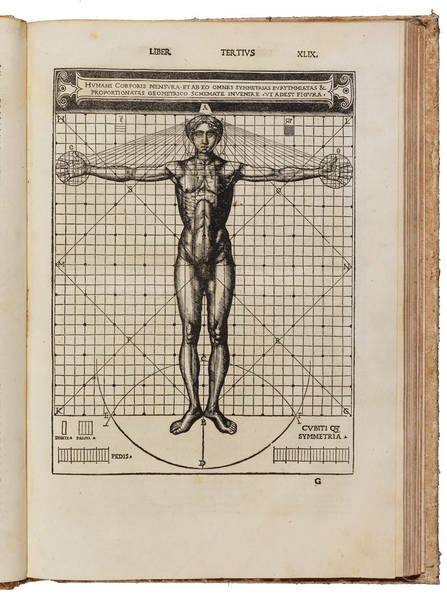 Falaschi, Valvassori’s 1533 illustrations of Orlando Furioso: the development of multi-narrative technique in Venice and its links with cartography, «La Bibliofilia», 77 (1975), 227-251; F. Zanetti, Nota per una storia delle illustrazioni dell’Orlando Furioso, in Ludovico Ariosto. Documenti, immagini, fortuna critica, 1992, 129-137; D. Javitch, Ariosto classico, 1999; A. Langiano, Sulla ricezione cinquecentesca del Furioso nelle arti: traduzioni possibili?, «Cahiers d’études italiennes» 17 (2013), 71-91; L’Orlando Furioso e la sua traduzione in immagini (orlandofurioso.org).